For text engraving, please type exactly what you would like to have engraved on each side including correct capitalization and punctuation. If you want handwriting engraved, type Handwriting & then you can upload your handwriting sample. What a wonderfully unique gift for that someone special. A timeless thoughtful gift for a girlfriend, wife, mom, best friend, daughter, sister, grandmother, or friend. I create each pendant from precious metal sheet metal & then cut out the shape and engrave the desired handwriting or text. The pendant is then filed, sanded, polished, and then the chain is attached and welded closed. 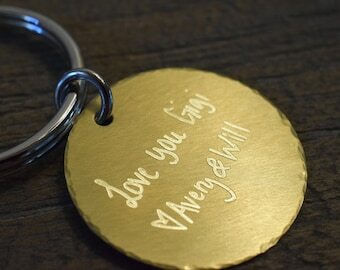 You can choose to have engraving added to one or both sides and engrave any word, date, name, or handwriting to make this a completely unique and personalized gift. Message me with any questions. All jump rings & clasps are soldered closed so you will have no fear of loosing your cherished necklace. 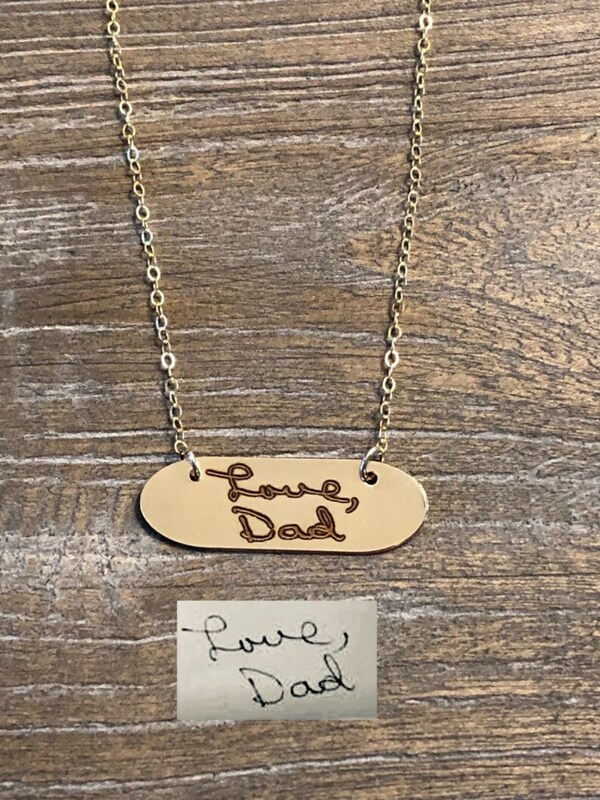 The necklace is designed, engraved, cut from sheet metal to exact dimensions, polished, finished & assembled with my own two hands with love and attention to detail. The necklace comes in sterling silver, yellow or rose gold fill, or 14k solid gold. Sterling silver is a great alternative to gold. Sterling silver will tarnish over time due to oxidation, but with the proper care and cleaning can be brought back to its shiny luster. To reduce oxidation, wear often and store in an airtight container or zip top bag. You can easily polish with any silver polishing cloth. Gold filled is a pressure bonded layer of gold that has 100 times more gold than plated jewelry. It is durable and won’t chip or flake. It is tarnish resistant and is a more economical alternative to 14K solid gold. It can even be worn in water. Gold filled jewelry is considered heirloom quality and will look great for many years when taken care of properly. Please avoid the use of “dip” cleaners. A gentle jewelry polishing cloth with clean off any oxidation or residue on your precious jewelry. Avoid the use of lotions, perfumes, etc. on your jewelry which can cause the jewelry to look tarnished & dull but can easily be cleaned back to its original luster. ***When purchasing this necklace, let me know EXACTLY what you want engraved. I will engrave the pendant with exact capitalization & punctuation, so please make sure you have typed everything correctly. Choking hazard. Jewelry should be worn under adult supervision and removed before sleeping. Not intended for use as a toy.